Should Outrigger Tiebacks for Powered Suspended Access Equipment Be Wire Rope? In the industry there is a misconception that portable outrigger beams and parapet clamps being used with powered suspended access equipment can be tied back using fibre rope, and often times it is old vertical lifeline rope that is used for this application. However, using rope in this application is an incorrect practice. Under the national CSA Safety Code For Suspended Platforms, the tieback cables for portable outriggers and parapet clamps must be of equal strength as the primary suspension rope. Since most powered climbers use a 5/16” or 8.4mm diameter wire rope that has a breaking strength of 10,000+lbs, the use of 5/8” polysteel lifeline (which has a breaking strength of only 9,000 lbs when new) is not adequate. In addition to that, ropes are usually terminated at the anchors with knots, and ANY knot will reduce the strength of rope by at least 25%. While ropes of the proper strength and construction (and when terminated with the proper approved knots) can be used with rope access systems and manual bosun’s chairs, they should never be used with any powered suspended equipment that has wire rope as the primary suspension line. 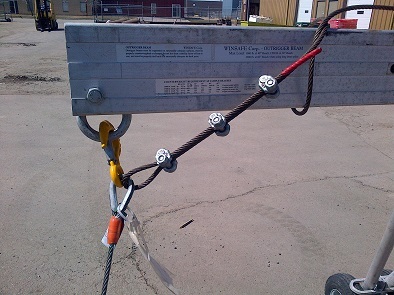 At Northern Strands, we will always supply the proper tieback cables and wire rope clips for this connection, and provide complete instruction on proper rigging of tieback cables as part of our Suspended Access Equipment Training course. 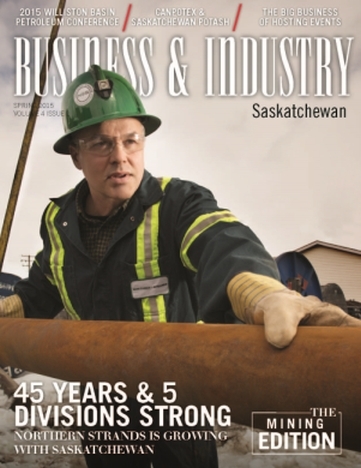 "Northern Strands is proudly Saskatoon, Saskatchewan owned and operated." It's Northern Strands 45 Anniversary! Northern Strands is celebrating it's 45th Anniversary! For 45 years Northern Strands has been an international supplier of mine hoist ropes. Throughout the year we will be posting blogs exploring the history of Northern Strands and how it has evolved into the five divisions it's currently comprised of; Mining(mine hoisting solutions), Engineered Fall Protection, Suspended Access, Rigging and Safety Training.